A Little Rock police officer told KARK that a taser may have also been used during the fight, which apparently also would’ve sounded like a gunshot. 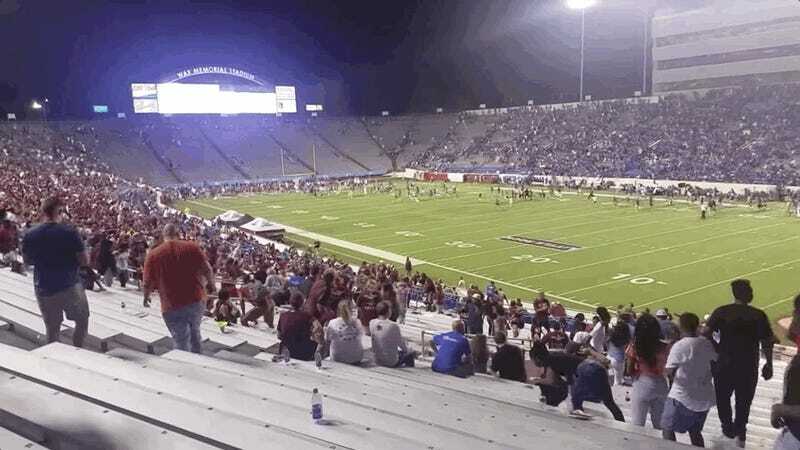 If a fight breaks out in a crowded football stadium and there are loud gunshot-like reports echoing around, a wise and understandable reaction is to leave the scene as quickly as possible. Arkansas is an open-carry state, and even if it wasn’t mass shootings are an American pastime, so the fear of firearms at a high school football game isn’t remotely unreasonable. By the time the source of the panic was identified and calm was restored the crowd was too dispersed and the scene was too disheveled, and the decision was made by the two schools to cancel the remainder of the game.